Lessons From the Stray Flower – He Said What?! It’s the time of year to call it quits – as far as my flower gardens, that is. My beds of beauty at this point on the calendar are mostly dead or dying beds of brownness. I had noticed for days that I really needed to buckle down and get it over with. All the areas that had once provided color and beauty were now dull and ugly. My flowers had done as well as they could during our history-making summer of stifling heat and drought. Now most of them looked spent. Not only tired and exhausted, but many of them positively dead. The garden would be lovelier without the dead growth, and our eyes would be pleased to look upon beds that were bare rather than beds that were full but wasted. I gathered the tools that I needed for the job. Small pruning shears, large pruning shears, garden gloves, rake, broom, and my trash container. I walked out back to the two flower beds at our patio and got to work. I bent over and began clipping with the small pruners, being careful not to pull the perennials up by their roots. Hopefully next spring these once beautiful flowers will grow again if I leave their roots intact. I worked among the Black Eyed Susans, the Shasta Daisies, and the Garden Phlox first, snipping and cutting. The trash container was filling up fast, so I emptied it into the large trash can and came back to continue the cleaning. When I came to the Tiger Lilies, I grabbed the large shears and began whacking away at the tall, tough stalks. They fell over the area where once they had stood tall and regal in their bright orange blooms. I’d scoop them up, toss them in the container, and begin again with the pruning. Death was all around me. Everything that was once full of beauty was now only brown and crisp. Dust was puffing up around me, getting on my clothes and in my hair. It was a place of dryness, of has-beens and what used-to-be. And then I saw it. 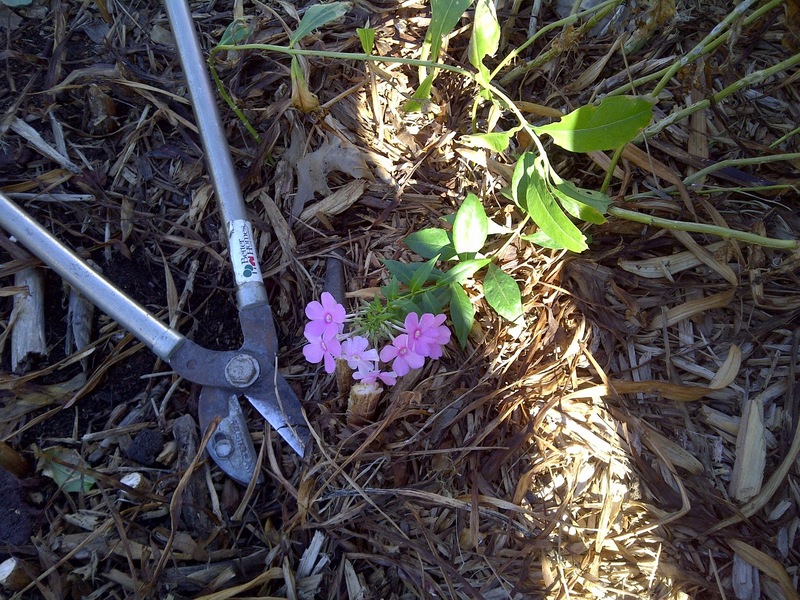 The little pink blooms laying on the ground caught my eye in an instant as I cut some dead stalks away. They seemed so out of place amidst the drab decay all around them. I paused and looked at them laying there so sweet and still. They were small but their beauty was enormous next to the ugliness all around them. They made me pause and catch my breath as I drank in their beauty and enjoyed the message that they gave to me. I smiled, refreshed in a special way, and then continued with my task at hand as I kept them in my sight. I tried not to disturb their blooms that reminded me of the beauty of the past and promised me of more beauty yet to come in the spring. Look out John she is preaching awfully good here.